First minister hails windfarm as an "exciting development for renewable energy in Scotland"
Nicola Sturgeon has officially opened the world’s first floating wind farm in Scotland. Scotland’s first minister officially opened the 30 MW Hywind Scotland wind farm today (18 October), which is situated 25 kilometres off the coast of Aberdeenshire, and being operated by Statoil in partnership with Masdar. “This marks an exciting development for renewable energy in Scotland,” said Sturgeon. 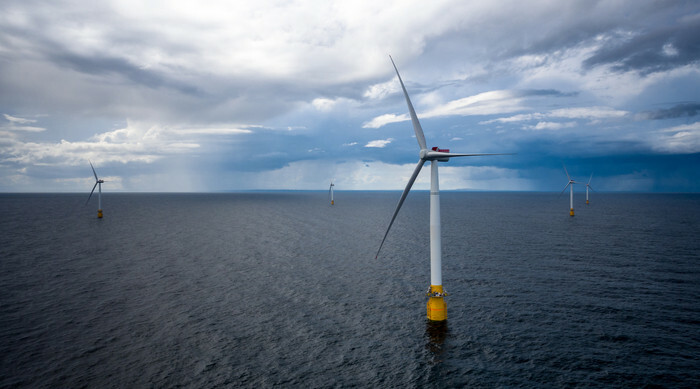 Statoil’s executive vice president of new energy solutions, Irene Rummelhoff, said Hywind can be used for water depths up to 800 metres and will be able to open areas “that so far have been inaccessible for offshore wind”. “The learnings from Hywind Scotland will pave the way for new global market opportunities for floating offshore wind energy,” added Rummelhoff. “Statoil has an ambition to reduce the costs of energy from the Hywind floating wind farm to €40-60/MWh by 2030. Knowing that up to 80 per cent of the offshore wind resources are in deep waters (+60 meters) where traditional bottom fixed installations are not suitable, floating offshore wind is expected to play a significant role in the growth of offshore wind going forward,” she added. The chief executive of Scottish Renewables, Claire Mack said: “Hywind’s presence in Scottish waters is a reminder that, as the windiest country in Europe, and with some of the deepest waters and most promising offshore wind sites, Scotland is perfectly placed to capitalise on floating turbine technology.